The Surya Namaskar is the salutation to the sun and the universe, and through yoga an individual powers his/her internal energy point known as the chakra. In the same way, Miss India through this national costume comes as the Chakra of love from the Indian people, to salute the universe. 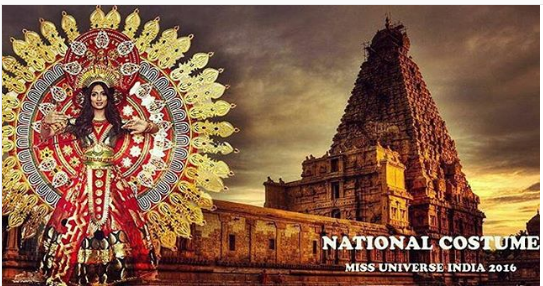 Through her national costume, Miss India brings to Miss Universe 2016/17, the theatrical and dance culture from the South Indian states- Karnataka and Kerala. It is the ancient art form which was invented by the first Indians, since DNA studies have revealed that this region holds the first inhabitants of India. Designed by K Krishnamoorthy and Melvyn Dominic Noronha, the costume is made with Indian silk brocade and is embellished with accessories made with wooden carvings and gold foil treatment. These techniques are one of the most ancient techniques used in the costumes of Kathakali (the state dance of Kerela) and Yakshagana (the theatrical art of Karnataka). 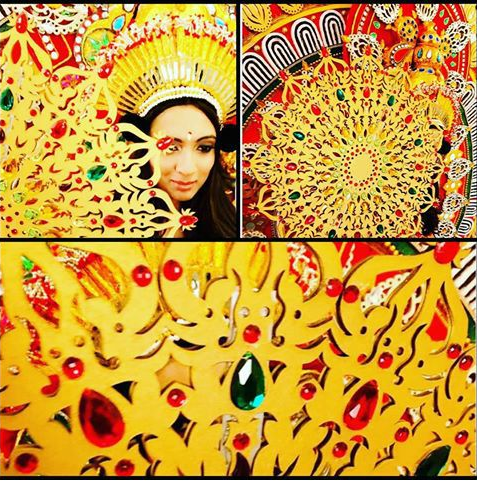 The costume is further embellished with intricately designed rays depicting the elephant, the sandal wood tree leaves and the lotus which are the state symbols of Karnataka. The initials of Roshmitha Harimurthy are also designed with the Devanagari script from the mother language of India - Sanskrit.